← November sales; NAIAS No Shows; e-Porsche; Buick Made in China, Dart Recall & more. My Michigan-based colleague Steve Purdy has provided yet another wonderful review of a new book for the auto enthusiast. 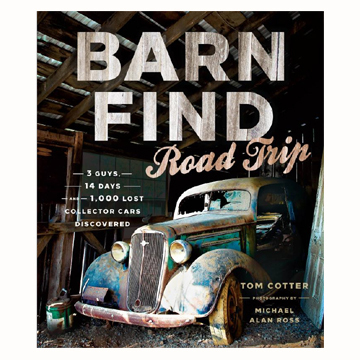 In BARN FIND ROAD TRIP a writer, a photographer and an automotive archaeologist, Brian Barr, Michael Alan Ross and Tom Cotter, hit the road for 14 days to find and document all the old cars they could, whether they be in barns, open fields, warehouses, car lots or anywhere else. They cover 2,700 miles throughout Pennsylvania, West Virginia, Virginia and Maryland. Read Steve’s review right here. This book just might make a great gift for the car-person in your life. This entry was posted in automobiles, book review, classic cars, educational. Bookmark the permalink.